For your inheritance, you may have the first of thirty-nine clues. The first team to successfully put together the clues, which are scattered across the world, will discover the secret of Cahill power and become the richest, most important people in history. Or you may take one million dollars in cash right now and walk away. 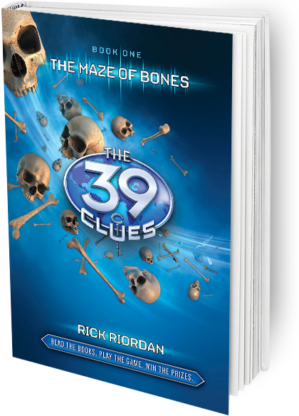 The 39 Clues will feature ten action-packed books. The first, The Maze of Bones, is written by Rick Riordan, who also designed the story arc for the entire series. The 39 Clues experience also includes trading cards and a huge on-line game which will allow you to become a member of the Cahill family and compete for amazing prizes! Each of the 39 Clues books will be written by a different author. Check the 39 Clues website for further information about the series.